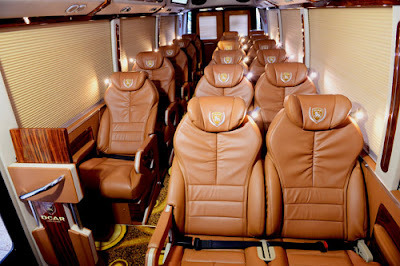 ET-Pumpkin Limousine Bus Sapa ,was invested by ET-Pumpkin Travel Company, the Interior of the car is designed for 19 seats to create a spacious, comfortable space for passengers. Styling chairs designed in an intelligent way (keep the spine back and neck) ensure health for users. 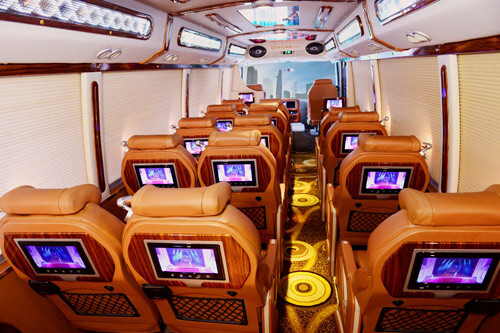 Besides, the car is also equipped with many additional Add-ons such as 3 g wifi system superior; the refrigerator; DVD screen and reading lights for each passenger, ... along with the decorative details are installed in the most delicate, as adding to the luxury and comfort of the car. 12:30 - 1:00 Pm Arrival Sapa center . 5:00 AM : stop over at KM 237 for tea-break .Tourist can taste local food . 21:00 PM Arrival HaNoi.Drop off at your hotel. The price of the ticket can be adjusted to less 30% and holiday.